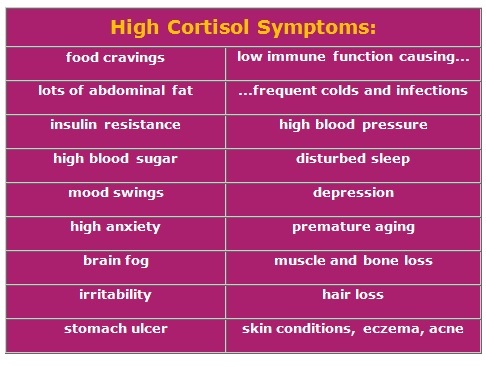 High Cortisol Symptoms List: How Does Stress Affect Health & Your Abdominal Fat? You may have heard that high cortisol symptoms are caused by adrenal fatigue – one of the most serious effects of stress on health. Always remember that high levels of cortisol (the stress hormone) has a great impact on your body fat; it leads to accumulating a lot of abdominal fat and to an increased resistance to losing weight. 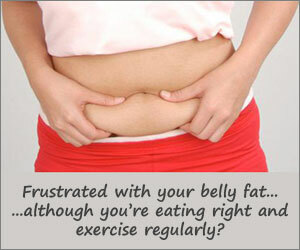 …you should know that being overweight and unable to lose belly fat is one of the most visible effects. And if you think that losing belly fat is exclusively about cutting calories and exercising more, think again. Haven’t you experienced the frustration of not being able to lose your abdominal fat despite eating right and exercising regularly? It took me a long time to figure out what was going on. In fact, until I found out that the resistance to losing this abdominal fat is in fact one of the high cortisol symptoms (among many others that you’ll find in the table below), high cortisol caused by chronic stress kept accumulating over a long time. A useful hormone that’s produced by the adrenal glands, cortisol helps regulate your blood sugar levels and your body’s use of protein, carbohydrates and fat. It also aids in energy production, controls inflammation, the functioning of your immune system and healing in general. But, under prolonged stress, cortisol levels become dangerously high. Elevated cortisol levels stimulate the release of glucose in your blood (to prepare your body for the fight-or-flight response to any stressors), but – in the absence of fighting an attacking tiger or flying the danger scene – this excess sugar is converted into and stored as fat – ouch! That’s why one of the nastiest symptoms of high cortisol that you’ll ever experience is increased body fat, particularly in the abdominal area. Adrenal fatigue and high cortisol levels not only make it very easy to put on a lot of body fat – losing it becomes almost impossible. You can’t feel an elevated cortisol level immediately. Rather, you start experiencing its negative impact on your health gradually, as its effects accumulate over time, in months or years. …Then, other things start to bother you: frequent colds or infections, unstoppable food cravings, anxiety, poor sleep and even depression. Medical research also lists among the symptoms of high cortisol a condition called Cushing’s Syndrome. While in men it manifests as a loss of libido and low fertility level, in women its symptoms can vary from growth of hair on the face to an irregular menstrual cycle. In fact, under intense and prolonged stress, many women experience premature menopause. The bottom line is this. Along with the symptoms listed above, both men and women experience weight gain and an increased resistance to lose the belly fat. …or psychological stress like, a demanding job, unemployment, worry over relationships or money issues, anxiety, unresolved emotional distress like frustration and resentment, your body reacts to it by releasing increasingly more cortisol in your blood stream to help cope with it. Sure, the obvious choice would be to reduce the stressors in your life–good luck with that! However, what you CAN do is use some fun ways to relieve stress regularly so it does not accumulate. Here are two (almost instant) stress relaxation techniques for reducing cortisol levels.